My older daughter figured out that Santa isn't real on her own and wasn't upset about it. When my youngest came to me and asked about Santa I turned it back on her and asked if she believed in him. When she said yes I said, Okay. But I figure this is the last year.... She's 6. My mom let us believe for as long as we wanted and when I asked her, she told the truth. I will never understand the parents that go to such great lengths to keep their kids believing long after reason has told them not to. The twins look adorable in the photo, and particularly identical as well. Usually I have trouble telling them apart. And TWO NORMAL SMILES? WHAT IS THE WORLD COMING TO??? I'll post our own Santa story when I have a few minutes alone with the computer. Probably sometime in June. I've commented on several Santa posts in the last couple of weeks. 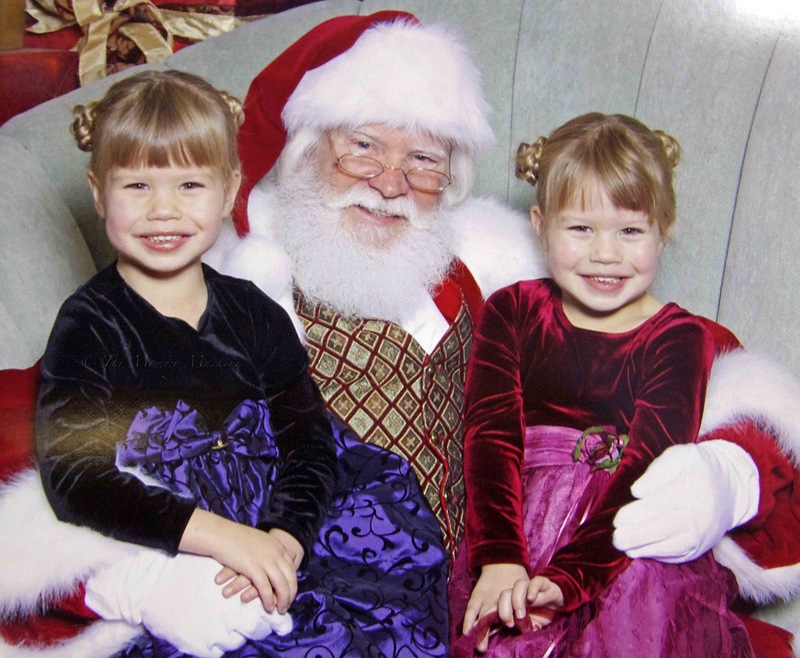 I never felt traumatized by learning that Santa wasn't "real" and neither have either of my kids, who are 17 and 14. I think for me, my kids, my mom, my granny, it's the spirit of Santa and the holidays and those traditions that have been going on in my family for generations that help keep Santa "real". At our house, no matter how old you are, Santa fills your stocking and Santa brings the most wanted or most loved gift. Even though my kids know it's their parents, it's the fun we have with talk of Santa and stories about how we hope Santa knows that trinket we want in our stocking or the gift we'd love to find on Christmas morning. My daughter is almost 8 and still hanging in with the Santa thing:) I think this will be the last year though...Too many kids around her are spilling the beans! Oh! The girls look so adorable!!!! I'm really not looking forward to the day when my girls figure this out. Christmas morning is just so much fun when you have little ones who have no idea what to expect. I have a feeling this year or next will be one of the last ones in which they believe in Santa. I never believed in Santa. My boys don't either. We didn't go through great lengths to discourage it, we just never brought it up. When they asked about Santa, we just say he's a fun part of Christmas, like dressing up at Halloween. It's just such a magical, wonderful time for children that it really is hard to let it go. I feel for you. The year I found out about Santa, my mom woke me up on Christmas eve and let me help set up my sister's Christmas gifts. After I went back to bed, she set up mine so I could be surprised too. Best Christmas Ever. When she asked, I was honest. Much to my relief, all Emily said was that she was relieved to know that mom and dad brought the presents and that there wasn't some strange old man sneaking in her house to do it. Snort. I would never tell a child there is no Santa. Sure there isn't actually a man that comes into our house on Christmas eve, but he is the spirit of Christmas. It's parents everywhere buying presents and making a special morning for their children. It's goodness and generosity. When you think about it, knowing the truth isn't giving up much at all. Visiting from sits! Oh, you're right. Definite dilemma! I think it's okay either way but I can't say I know what I'd do because baby girl is way too little to understand or care. P.S. Adorable picture!